And this time, you can’t blame the Government – unless you blame the Government for creating the movie classification system in the first place. But I’m getting ahead of myself. If you haven’t seen the new blockbuster sequel, which opened here 10 days ago, but you plan to, consider this a spoiler alert. 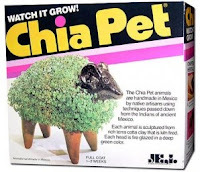 For example, it seems that whenever Willis uses the four-syllable bad word that describes a person who has carnal knowledge of a maternal parent, the word is replaced by an audio clip of someone saying something that sounds like “chia pet”. As in “Yippee ki-yay, chia pet.” Which, of course, makes no sense at all. It’s like watching a poorly dubbed movie on Channel 5 – except you paid for it. “Please note, the audio inconsistencies within the original movie presentation are intentional. 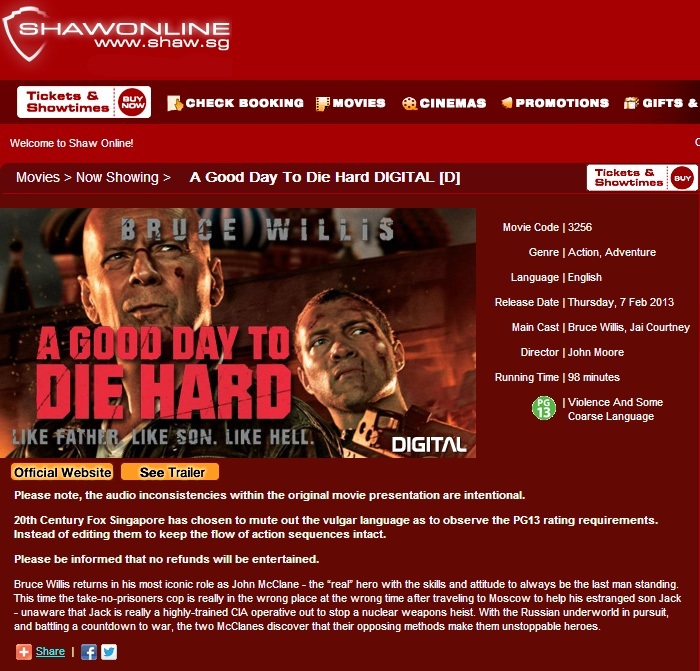 “20th Century Fox Singapore has chosen to mute out the vulgar language as to observe the PG13 rating requirements. Instead of editing them to keep the flow of action sequences intact. That last line would suggest that some ticket-buyers have been upset enough by the “audio inconsistencies” to ask for their money back. This is kind of unprecedented. And a few people have done just that on the 20th Century Fox Singapore Facebook page. “The Die Hard franchise has always thrived on its tough-talkin' characters. “Why censor all the foul language, kill the movie’s ‘tough guy’ spirit and disappoint moviegoers familiar with the vernacular of the franchise? “You even had to hack the iconic ‘Yippee ki-yay’ line. "The cuts were very jarring and distracting indeed. “I expect you as a movie distributor – as someone who appreciates movies – to at all times possible show the film as it is and fit it into the right classification; to give the audience a deserved, fair, uncut representation. Wow. Talk about a die-hard fan. But I’m surprised and disappointed that there isn’t a bigger outcry over this vandalism of a cinematic work of art, albeit one with an overlong multi-vehicle chase and too short running time. This affront to moviegoers could’ve been prevented or at least mitigated. Let me take you back to 1999 when Singapore made international news in a rather embarrassing way and it had nothing to do with match fixing. It involved another movie sequel. That was when Singapore changed the title of the Mike Myers comedy Austin Powers: The Spy Who Shagged Me to Austin Powers: The Spy Who Shioked Me. 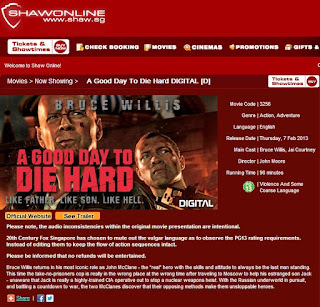 The Singapore Board of Film Censors had asked the film’s distributor, Warner Bros, to remove the word “shagged” from the title as the term was considered “crude and offensive”. Warner Bros, on its part, decided to replace “shagged” with the word “shioked” because it would generate a "nice, funny feeling". The spokesman said: “This title also brings attention to Singapore. We can claim this title as our own as it can't be used anywhere else. Expectedly, there was a huge outcry over the new title – and this was before social media. The big problem for me was that “shiok” is an adjective, not a verb. So to be grammatically correct – if that’s possible with a Singlish word – the new title should be Austin Powers: The Spy Who Made Me Feel Shiok. But that would make the title, which was already too long, even longer. Anyway, my point is, because of the outcry, the movie was eventually allowed to be shown here with its original title. Fourteen years later, the original, uncensored version of A Good Day To Die Hard could’ve also been saved this way, especially now with social media and Speakers’ Corner, which were specifically created for this purpose. Instead, we were distracted by the Population White Paper and Facebook confession pages. All I can say is “chia pet”.